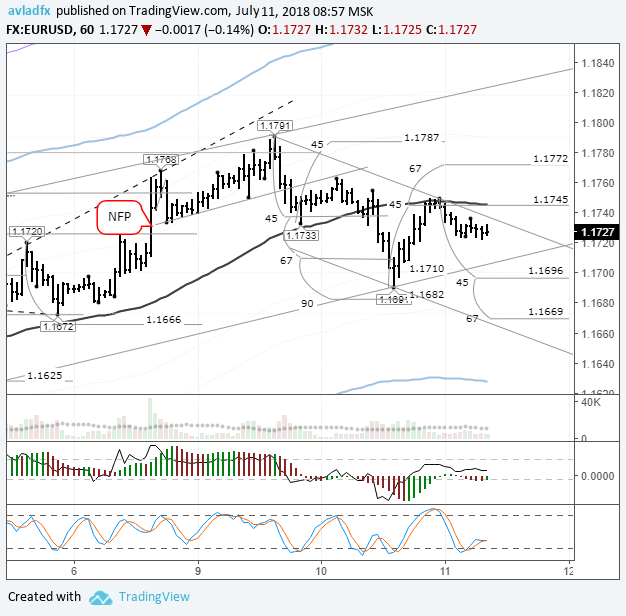 Forecast and technical analysis EURUSD on July 11, 2018. On Tuesday the 10th of July, trading on the euro closed slightly down. During European trading, the euro fell to 1.1691. Buyers managed to win back most of the losses by the close of the day. The downward correction on the dollar index contributed to the price recovery. The market seems to have calmed down after the resignations of British government ministers. The price returned to 1.1750. 14:20 US: OPEC monthly report. 15:00 Eurozone: ECB's Mersch speech. 17:00 Canada: BoC interest rate decision, BoC rate statement, BoC monetary policy report. 17:00 US: wholesale inventories (May). 17:30 US: EIA crude oil stocks change (Jul 2). 18:15 Canada: BoC press conference. 18:35 UK: BOE's Governor Carney speech. In the European session, sellers successfully broke the trend line and lowered the price to 1.1691, just short of 90 degrees. The euro jumped to the lb balance line (sma55) against the background of a downward correction against the dollar. The pullback amounted to 45 degrees. The current rate at 11:47 (GMT+3) is 1.1738. In European trading, buyers are trying to continue yesterday's upward movement. I decided against making a forecast due to two diverging pin bars on the daily timeframe obscuring the technical picture on the hourly period. As a result, a corridor was formed between 1.1691 and 1.1791. We will go wherever the breakout takes us. The economic calendar for Europe is empty and all eyes are on the Bank of Canada meeting. The market expects the base rate to increase by 0.25%. The BoC's decision will affect the dynamics of the Canadian dollar, so be vigilant if you have open positions on it. In addition, market participants are paying close attention to Sino-US relations, as well as negotiations between the UK and EU over Brexit, which could result in the resignation of two more representatives of the Conservative Party of Great Britain, The Sun reports.